4.30 p.m. I keep staring at the silent telephone, my finger itching to dial the usual number, also hoping against hope that it will start ringing and I can have my usual quota of 20-40 minutes talk time with Amma – she’d go on and on about the day-to-day trivia repeated not less than thrice, as I’d ‘hm, haw, oho..’ - with a question here or an advise/ answer there. She needed someone to talk to, so I’d be the willing recipient – the patient, silent listener. That’s what comes to mind first – Amma’s penchant for talking – I feel she must have spent a good part of her waking hours talking ‘twenty two to the dozen’! This won her a lot of friends. In fact, she made a brand new young friend barely 8-10 hours before she bid her final goodbye. This newlywed who had just moved in next door visited her to say hello and ended up spending a good three hours with her at the end of which she knew the ‘who’s who’ of our complete family as Amma had supplemented the details with the photo albums! You can call her a ‘connoisseur’ of family photos. Any photo you give her becomes a prized treasure. Her favorite pastime was ‘album viewing’ – she’d have seen and shown the albums more than all other family members put together! And she’d love to pose for pictures – but only after making sure she was draped in a nice saree. Oh sarees – she was very fond of buying – or even just seeing. 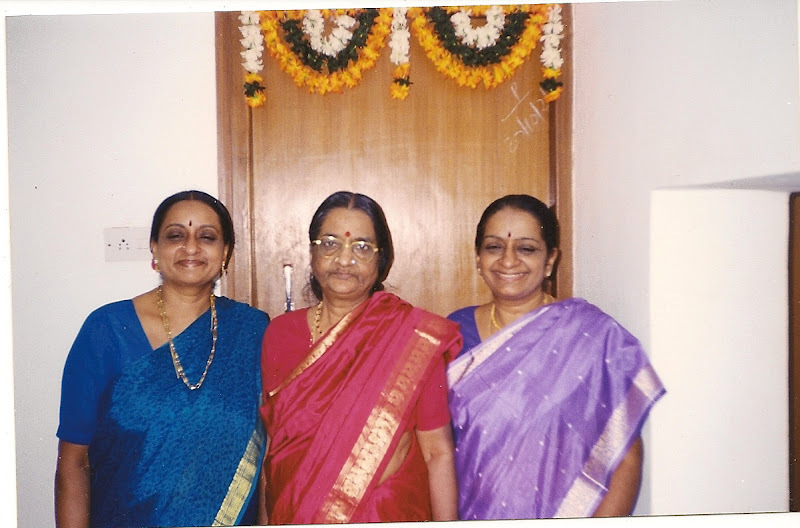 Every trip of hers to Madras would bring sarees for all of us. She had a great collection – well-maintained and well-used. Her zest for life even at seventy plus was enviable! Mention of a marriage or a music program would kindle a sparkle in her eyes and a cheer on her face. She’d take her own sweet time to get ready – you can’t hurry her. In fact more minutes would be spent on the selection of the saree for the occasion but at the end of it she’d be the best dressed among the lot! She’d love it when we pinned her pallu neatly for her – one thing she always admired but never mastered. 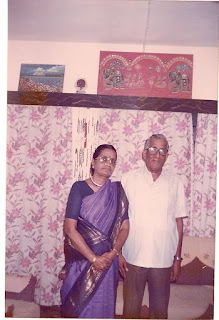 She’d never leave home before asking, “Powder saria irukka?” Again, just eight hours before she died, she had been seen in a crisp saree taking a walk around her building – for a whiff of fresh air – another insatiable craving of hers. Meals had to be piping hot – all the better if it were straight from the frying pan to the plate! She was the slowest eater ever I think! Yes, she was fastidious about food but she didn’t mind tasting new stuff and she enjoyed what she ate. But regular food had to be prepared her own way – which she had imparted to us, her daughters, and had genuine pride about our cooking. When we were teenagers, she’d call us in the kitchen during festivals to assist her – we picked up our culinary skills the best way - by observation, not from recipe books. And if our children and grandchildren are proud of our tasty treats, they know who to thank! Even at her age, she’d get all flustered and enthusiastic during festivals. That brings to mind Amma’s unbending nature – not willing to make compromises or major adjustments. Having had her own way all her life, expecting a major change on her part, according to her, was asking for too much! Little wonder that she’d argue on and on with a child-like stubbornness and defiance throwing logic to the winds – the opponent would be driven to the wall and forced to give up! If anyone could boast of giving her a stiff resistance – at times – it was her brother and her son! It is indeed to her credit that she managed to live her life on her own terms – independent, not cowed down by circumstances - till the very end – Providence was on her side – she was very lucky in death – sudden and as painless as can be. One admirable trait of hers was her complete honesty – she spoke nothing but the truth even if she were to sound harsh or blunt! She was not afraid of anyone or anything. This trait enabled her to cling on to her independence even when she was not in the best of health - she had tremendous will power. A negative trait was her habit of ‘worrying’. She always needed something to worry about – never mind whether it was major or minor. So we’d be content to let her chew the cud of a trivial issue rather than solve it – you see, that would be giving her a chance to find some other ‘botheration’. She never learnt not to worry about issues which are beyond our control. She loved to be unreasonable, I think. Her extraordinary attachment to Madras, especially her ‘Karpagam Avenue’ house even after a decade may seem unnatural to others but only she knew her emotions best. 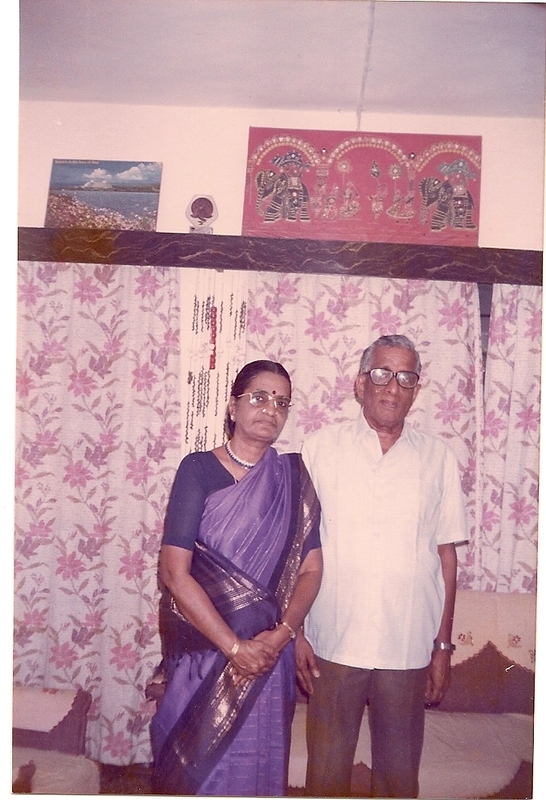 She was lucky to have spent two months in Madras (though not in the best of health) and got to meet all relatives before leaving the world. Amma knew a little bit of everything and she would make a thousand and one queries before making a decision (she tried her best to postpone her decisions). She was definitely very clever. The younger generation may ridicule her caution and calculative planning but the fact cannot be denied that the family has only benefited from that. She wanted the worth of every penny she spent. She knew what to give who and when and she was pretty generous. But she wouldn’t be taken for a ride – never. She was very prim and proper and wanted everything in place. I still remember the court of inquiry she’d conduct at home when we were kids to convict the culprit responsible for – say - the missing needle. To avoid getting charge- sheeted, we’d resolve to get a dozen needles. We have realized over the years that she had a point – the more the stock on hand, the more careless we tend to become! Amma’s chapter is over. Her demise has left a big void in my life – a mother’s place is definitely unique and irreplaceable. I won’t hear her “vaayendi, leave taane onakku”. I won’t have to put up with her ‘killing‘hospitality – offering this and that every ten minutes and saying at the end of it –“onakku pasikkaradho ennavo.” I won’t have pangs of guilt rebutting her impossible fervent appeal, “oru naal koodi irunduttu poyen”. I won’t have to use my strategy – telling her about my ‘two-day’ trip if I had planned for three days – and pretend to give in to her appeal so both wouldn’t be losers! It is rightly said that we crave for something all the more when we lose it! Has Amma become closer to me after she was gone – ‘her presence is felt more in her absence’! This was a lovely read, Brinda. Your mother was one of the kindest people I have known, and I will always remember her warm hospitality and genuine happiness at seeing me, every time I visited her.